Earn 485 loyalty points, worth £48.50, when you buy this. This beautiful, unique necklace features an amazing blue opal doublet with a great play of light. This is a one-off necklace handmade by John. The central opal measures approximately 17mm x 12mm and is set in an 18 carat gold bezel. A hand carved cocobolo wooden shape hangs by it with various colourful stones at each side. These stones are, black onyx, amber, red sea bamboo, turquoise, green sea bamboo, carnelian and lapis. 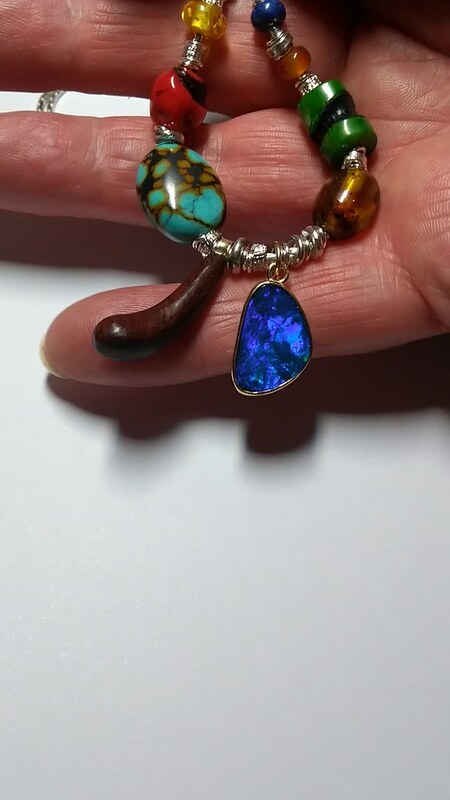 Materials, sterling silver, 18 carat gold, opal doublet, cocobolo wood, black onyx, amber, red sea bamboo, turquoise, green sea bamboo, carnelian, lapis.